First published in 1981, Slap It! 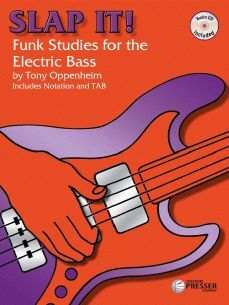 has become one of the standard books for electric bass players wanting to learn more about playing and sight-reading slap bass lines. Slap It! contains 151 slap bass exercises in standard music notation and TAB, and 98 recorded slap bass examples on the included audio CD. Slap It Online is Tony's new online publication presenting a series of all new slap bass exercises along with audio demo recordings. If you like Slap It! you're going to love Slap It! Online!